Back in the olden days, the only way to get a tattoo you no longer wanted removed from your body forever was to simply have it cut out; that, or have it basically burned off with chemicals, or scraped off using dermabrasion. Any of these sound good? No? We didn’t think so. It’s lucky for the millions of people around the world that methods of tattoo removal have advanced so significantly since then, as a mammoth upswing in the number of people opting for ink has led to an equally similar skyrocket in the number of people who want to get rid forever and forget that ex-boyfriend – and their name – ever happened. The previous go-to treatment for getting rid of tattoos was the Q-switch laser, a technique that uses lasers (the clue is in the name) to heat up the insoluble ink particles that make up your tattoo until they’re small enough to be naturally absorbed into the body. Famous for producing relatively quick, painless results with minimal scarring, the Q-switch nonetheless carries a small risk of damage to the surrounding skin from the heat. But hey, that’s OK – you can just get PicoSure removal treatment instead. Rather than using heat to get the job done, the PicoSure method uses short, extremely powerful pulses to shatter the ink particles into even smaller pieces than a laser can, so they’re absorbed even faster; whereas Q-switch needs up to 20 sessions to get the job done, PicoSure can get rid of your ink in about half that time. It even works on tricky blues and greens! 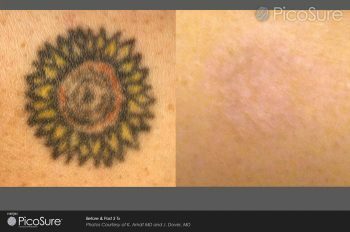 We’re happy to offer PicoSure laser treatment to everyone who wishes their tattoo had never happened. Call in for a consultation today and we’ll be happy to help in any way we can.